In many ways, mistletoe can be considered to have “beaten the system”. As parasites they are far less affected by soil fertility and moisture availability than regular plants, and have developed partnerships with birds to spread their seeds far and wide. They produce abundant seeds, occupy extensive distributional ranges across a wide range of habitats, including mangroves, deserts, cities and other extreme environments. Accordingly, just like starlings, rats and other evolutionary success stories, you might expect to find them everywhere—infecting most trees and dominating entire ecosystems. Yet, mistletoes (as with other parasitic plants) are characteristically rare in undisturbed systems. In terms of number of individuals, number of species and overall dimensions or biomass, they are minor to very minor components of woodlands and forests. But, in agriculture-dominated landscapes and other disturbed systems, mistletoe can become super-abundant. These two situations reflects two sides of the same coin, so determining which processes regulate their numbers in undisturbed systems can reveal how these processes have broken down in disturbed systems. 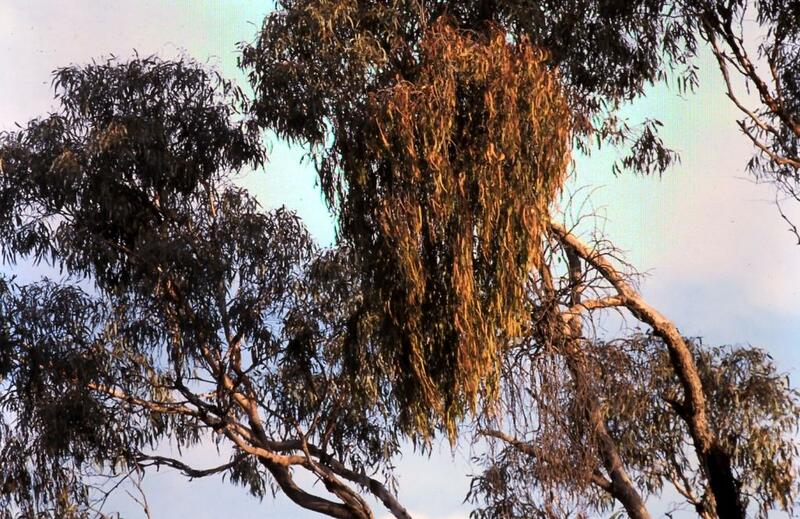 A large box mistletoe in the canopy of a eucalypt. Mistletoe has a wide range of herbivores and other natural enemies that play important roles in controlling their spread, much of which happens in the early stages of their life cycle. Several flies (including Cerapitella loranthi which is specific to Amyema species) lay their eggs in developing mistletoe fruits, reducing the number of viable seeds produced. Although the seeds are too large for most finches, parrots avidly consume mistletoe fruits—seed and all—greatly reducing the standing crop available for the fruit-eating birds which act as seed dispersers. Of those seeds removed and deposited intact, most land on the ground, dead branches or other unsuitable sites, so only a tiny fraction of the seeds produced by a plant end up in a location where they could establish. Even then, they’re not safe—most dispersed seeds and young mistletoe plants are eaten, especially those landing in lower branches accessible by browsing animals. Those lucky few that make it this far are then highly sought after by possums and caterpillars, with many mistletoe clumps defoliated before they have a chance to flower or set seed. There is little evidence that mistletoes are limited by pollinators or seed dispersers, but a growing appreciation of the role herbivores play in driving mistletoe occurrence patterns in many habitats. With their semi-succulent foliage, thin persistent bark and lack of any kind of storage organ or tuber, mistletoes are far more sensitive to fire than most of their hosts, and bushfires represent a critical process regulating mistletoe numbers in many habitats. The two root parasitic species are notable exceptions to this rule, however—both have below-ground storage organs and actively re-sprout after even intense fires. Rather than fierce crown fires, even lower intensity ground level burns can kill other mistletoe plants. In one documented example, a fire burning through eucalypt forest leapt a moist gulley in which a grove of River Oaks Casuarina cunninghamiana was growing. These trees hosted many Needle-leaf Mistletoes and, despite the hosts showing few effects of the over-burn, all mistletoe plants in the gulley were killed. Unburned areas nearby still contained living mistletoes; these populations representing refuges from which mistletoes could recolonise burned areas over the following years. So, mistletoe numbers in a particular area may reflect the time since the last fire, a signature that may persist for considerable time. As part of long-term research in the Blue Mountains west of Sydney, an intense bushfire swept through the study area and, twenty years later, mistletoe was either still absent or in dramatically lower densities in the burned areas compared with nearby unburned forest. The two root parasites are notable exceptions to this rule—both have below-ground storage organs, and both resprout vigorously after fire. Although lacking roots and having no direct contact with the soil, moisture availability can have a range of indirect effects on the parasite via their hosts. This is most apparent in the arid zone where mistletoe infections are frequently restricted to creeklines, presumably reflecting preferential growth on hosts with more reliable access to water. 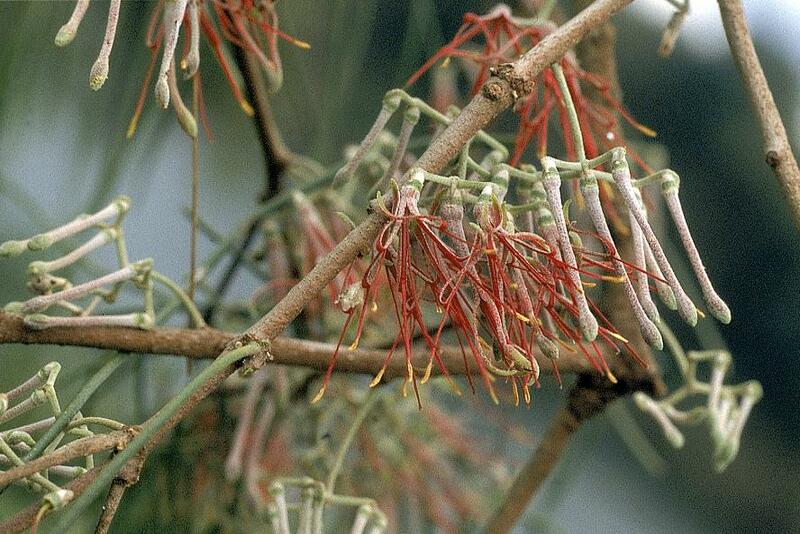 With their limited ability to regulate water loss, mistletoes are generally affected by water stress long before their hosts. Hence, mistletoes display greater sensitivity to drought, and periodic dry spells may regulate mistletoe numbers. I noticed this process firsthand during a research project in far north-western New South Wales, examining determinants of mistletoe and sandalwood occurrence. Pale-leaved Mistletoe was abundant in Mulga woodlands but, after three exceptionally dry years, most mistletoe clumps died, even those on hosts growing within dry creek beds. Likewise, mistletoe plants may be sensitive to soil fertility indirectly, preferentially growing on host plants with greater access to nutrients. In addition to influencing host identity (explaining the popularity of nitrogen-fixing plants as hosts), this may also affect an individual plant’s susceptibility to infection. Thus, plants growing in more fertile soils, with deeper root systems or with mycorrhizal associations may be more likely to support mistletoes to maturity. Definitive Australian studies on this topic are lacking, but work from elsewhere has implicated access to nutrients as a component of host quality. Finally, gravity plays a role, with many mistletoe plants falling from their host, especially after storms. Mistletoe plants have a high water content making them surprisingly heavy; mature individuals of Box Mistletoe have been estimated to weigh in excess of two hundred kilograms. Infected branches are often unbalanced and more susceptible to breakage through wind shear. Moreover, the greater volume of foliage associated with mistletoe clumps can add significant weight to the branch after rain. As well as preventing most mistletoe plants from dominating the canopy of their host, this process also yields hollows, spouts and fallen branches—all valuable resources for native animals. Having established the principal factors regulating mistletoe numbers in undisturbed habitats, evaluating how these processes have changed in various disturbed habitats might reveal the underlying reasons for mistletoe increases. Why has mistletoe increased? A wide range of native plants and animals benefited from the European settlement and development of southern Australia, manifested in expanding distributions and larger population sizes. Thus Galahs, Crested Pigeons and Eastern Grey Kangaroos are far more abundant today than indicated in the accounts of early settlers, and their distributions have extended into previously unoccupied areas. Mistletoes have become noticeably more abundant in many parts of southern Australia, but there have not been any documented increases in their distributional range. So, rather than a species-level phenomenon affecting where the plants can grow, mistletoe increases appear to operate at the population-level, reflecting changes in land-use at local and regional scales. Reported increases in the abundance of mistletoe are not uniform. Compared with continuous forest and woodland, mistletoes have become far more abundant in paddock trees, shelterbelts, roadsides and other woodland and forest edges in many regions. While these increases are ongoing in many regions, they were first widely noted in the 1920’s and 1930’s, so the underlying land-use changes likely occurred around the turn of the century. Many of the land-use changes associated with agricultural development during this period minimised or removed many of the natural control mechanisms, leaving mistletoe numbers unchecked. Government sanctioned habitat clearing occurred throughout this region and, while the largest trees were occasionally left for shelter, vast areas of woodland forest were cleared to create cropping fields and grazing pastures, especially areas with deeper and more productive soils. Along with Koalas, Common Brush-tail Possums were shot in their thousands in many districts for their skins, with official records documenting several million skins exported from major ports. Numbers of hollow bearing trees decreased greatly, wattles growing in the understorey of many woodlands and forests were selectively harvested for their bark (for tanning leather), and most nectar bearing shrubs were either cleared or consumed by stock, further simplifying the structure of remaining habitats. The intensity and frequency of fire changed dramatically, with fewer fires in many regions as fires were actively extinguished by land-holders and land management agencies. 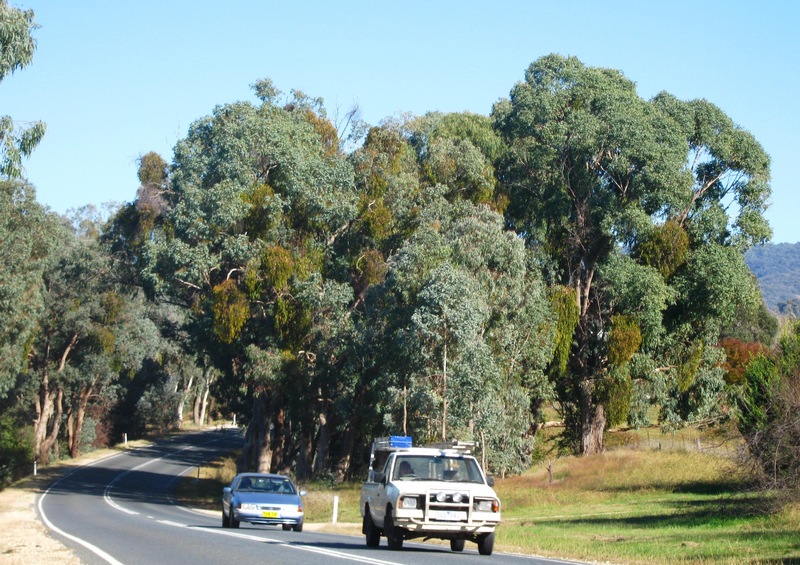 While the primary objective was to preserve houses, fences and other assets, bushfires in uncleared areas were also actively managed, including in continuous forests where mistletoe increases have since been documented. The tendency for sheep and cattle to congregate in the shade leads to soil compaction and nutrient concentration beneath paddock trees and shelterbelts, greatly elevating levels of Nitrogen and Phosphorous. Finally, the clearing of wooded habitats fundamentally changed the availability of water in many woodland and forest habitats, with run-off increasingly greatly in roadside areas and habitat adjoining open fields and paddocks. Rather than each of these factors operating independently, many of them interact, magnifying the overall impact on mistletoe occurrence. Thus, an isolated paddock tree is likely to have greater access to water through run-off, increased access to nutrients from stock camps and run-off, decreased visitation by possums and a low likelihood of being affected by fire. Thus, most of the normal factors reducing the growth and survivorship of mistletoe have been minimized or completely removed. Moreover, since the overall canopy of the tree would be less shaded less than if it were growing within a woodland, the increased access to light makes establishment of mistletoe plants more likely in the first place. So, rather than “stressed” trees being more susceptible to mistletoe infection, the factors contributing to the tree’s stress are the same suite of factors that favour mistletoe establishment and growth. Mistletoe control. In areas with high abundances of mistletoe, individual trees can suffer premature mortality. In woodland or forest settings, this rarely presents problems, with the dead trees soon being replaced by natural regeneration. In plantations or managed forests, infected trees are routinely removed to prevent infection spreading and maximise growth rates and yields. In many agricultural landscapes, however, continuous woodland or forest no longer occurs, with native trees represented by isolated trees and small remnants surrounded by cleared land. These large trees provide shelter for domestic stock and, given the lack of recruitment, they have a disproportionate value. In these cases, mistletoe control can be useful to reduce the number of mistletoes on individual trees, allowing the tree to recover, increase its vigour and boost its resistance to herbivores and other natural enemies that can exacerbate severe mistletoe infections. Various herbicides have been trialled for their effectiveness on mistletoe, with several chemicals and application techniques reasonably effective. 2,4-Dichlorophenoxyacetic (or 2,4-D) and Glyphosate both have high success rates in killing mistletoe plants, but some trees are sensitive to these chemicals, and widespread use of them may result in the occasional death of trees. Foliar spraying can be effective, but each individual mistletoe clump in the tree’s crown needs to be sprayed, which can become prohibitively difficult for very large or heavily infected trees. An alternative application method is stem injection—boring a series of holes in the trunk of the tree and injecting the herbicide directly into them. The poison enters the fluid carried in the vascular tissue of the tree, eventually transported throughout the plant and being absorbed by all of the mistletoe plants. 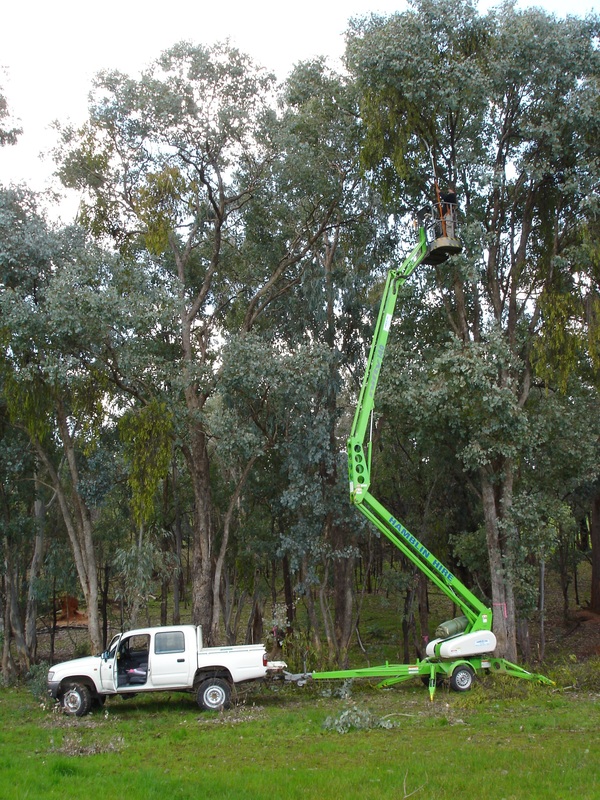 This method is much more effective in controlling mistletoes and far less time consuming than foliar spraying, but can result in higher rates of tree death, especially if conducted when the tree is actively growing. Another option for mistletoe control is manual removal. Simply cutting off mistletoe clumps is an effective method—as long as the clump is cut on the tree side of the union, there will be no re-sprouting. For every large mistletoe removed, however, there are often many small seedlings that remain undetected, so follow-up removal is generally needed. Heavily infected trees can be pollarded, with the entire crown removed, allowing the tree to re-sprout. Trials of these methods were conducted in the New England region of New South Wales, comparing effectiveness of different pruning techniques as well as their cost. Removing all mistletoe plants individually was the most effective method, and cost between $15 and $20 per tree (in 2008). So, while a cost-effective strategy to treat a small number of highly valued trees, these methods are not economically practical at larger scales. As well as cost and unintentional tree mortality, the difficulty with all of these methods is that they are necessarily short-term solutions to a long-term problem. Neither chemical control nor pruning changes the reasons why mistletoe is so abundant in the first place—it treats the symptom rather than identifying and addressing the underlying causes. As such, control will need to be ongoing, otherwise mistletoe numbers will simply return to previous high levels within a few years. So, although useful for treating individual paddock trees, street trees or other individual trees of high significance, a longer-term solution is needed to control mistletoe in abnormally high numbers across larger areas. Larger-scale management. An alternative approach is to look past the mistletoe to the underlying ecological processes, and apply management techniques to promote the natural set of factors that normally regulate mistletoe numbers. Installation of nest boxes can achieve rapid results if natural hollows are limiting, but only if possums or gliders are present in the site. Quite often, one of the reasons for increases in mistletoe relates to the complete lack of Brush-tailed Possums in the area, and strategic translocation of possums has proven effective in some areas (see text box 2). Fires no longer occur in many agricultural regions, and a strategic controlled burn can have a dramatic effect on mistletoe abundance, as well as numerous other processes in native woodlands and forests. While not practicable in all settings, the use of fire can be a useful management tool, lowering mistletoe abundances and promoting the germination and growth of other native species. Many of the butterflies and moths that lay their eggs on mistletoe plants are constrained by the availability of nectar. Many of these plants are highly palatable to domestic stock, and no longer occur in the understoreys of woodland and forest remnants. By restricting stock access and undertaking revegetation works, these plants can be restored, boosting numbers of beneficial insects. Parrots, gliders and a variety of other natural enemies to mistletoe will also benefit from the development of a more complex understorey, visiting the site more regularly or re-establishing resident populations. Fencing off remnant woodland and isolated trees will also promote recruitment and regeneration of existing plants, eventually providing replacements as the mature trees decline with age. So, rather than a quick fix or a magic bullet, an integrated approach to land management can prove a highly effective long-term strategy to bring mistletoe numbers down, retaining their value to native animals without compromising the health of their host trees. Rather than exclusively affecting mistletoe numbers, these strategies form the basis of conservation farming, benefitting a wide range of native plants and animals and simulating the natural processes keeping their numbers in check. Rather than being at the expense of agricultural production, it is becoming clear that these management strategies have the reverse effect, improving economic returns through more effective control of weeds, damaging insects and a wide range of other pathogens.